The State of Utah has done some remarkable work in addressing wildlife needs along Utah’s roadways, especially during the past decade. The Utah Division of Wildlife Resources (UDWR) is working alongside the Utah Department of Transportation (UDOT) to identify critical hotspots throughout the state where wildlife mitigation features are needed. Dr. Cramer documented more than 43,000 successful mule deer passages through wildlife crossings over a six-year period. These crossings are important in reducing wildlife-vehicle collisions and in allowing wildlife safe movement over and under Utah’s expanding transportation network. Wildlife crossing structures (underpasses and overpasses), exclusionary fencing and a variety of wildlife signs are some of the ways that UDOT and UDWR are working to decrease the number of wildlife that are killed from vehicle strikes. 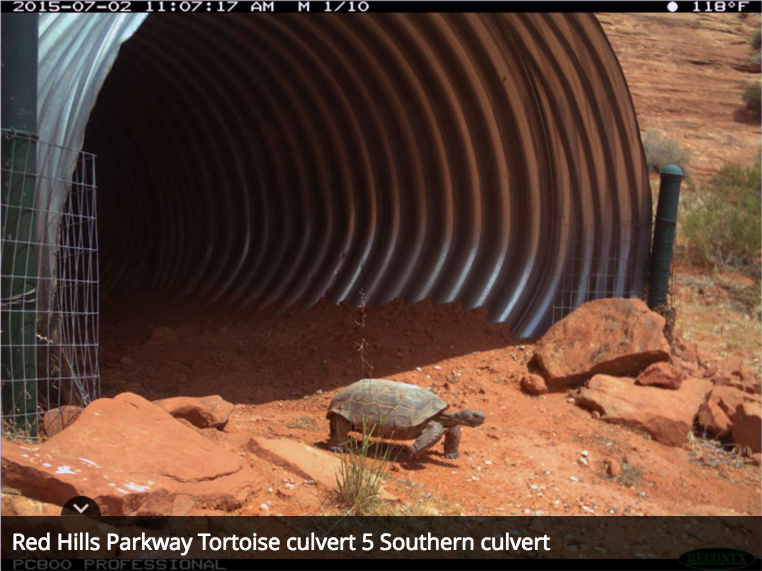 Utah currently has nearly 50 structures that have been constructed specifically for wildlife passage, and there are dozens more (culverts, bridges, etc.) that are used by wildlife to find safe passage across roads. A desert tortoise using the Red Hills Parkway crossing in southern Utah. It takes a lot of planning, coordination and funding to get wildlife needs built into the transportation network. As a result, wildlife crossings can’t be placed everywhere. 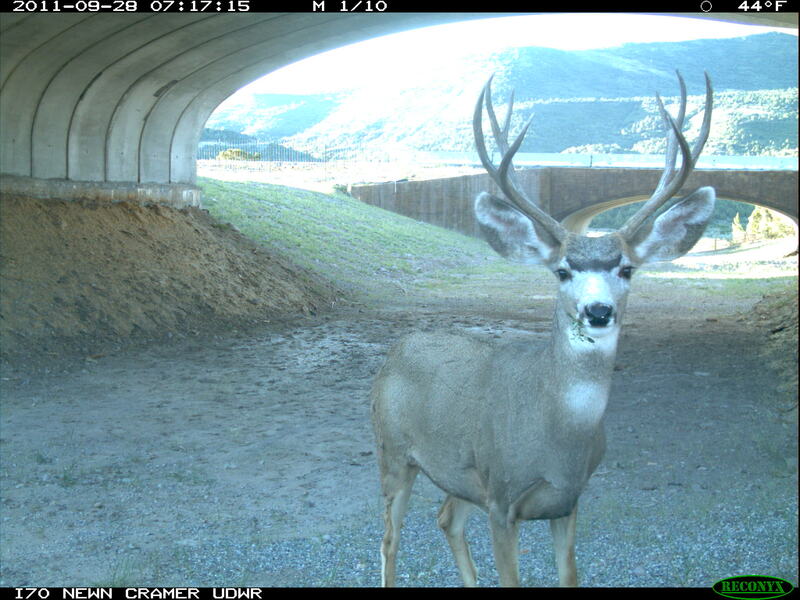 UDOT and UDWR work together to determine potential locations for wildlife crossings. Crossing locations are selected based on several factors, most importantly, the number of wildlife vehicle collisions that are occurring in an area. These locations are then prioritized based on numerous criteria including: Is an upcoming highway project already being planned for the area? Is there enough funding to include a wildlife crossing in the project? If placed, will the crossing facilitate wildlife movement via established migration routes? Will the anticipated benefits of a crossing outweigh the cost of constructing it? From initial concept to actual construction, most wildlife crossing projects take several years or more to become a reality due to the planning and funding processes that UDOT is required to complete. 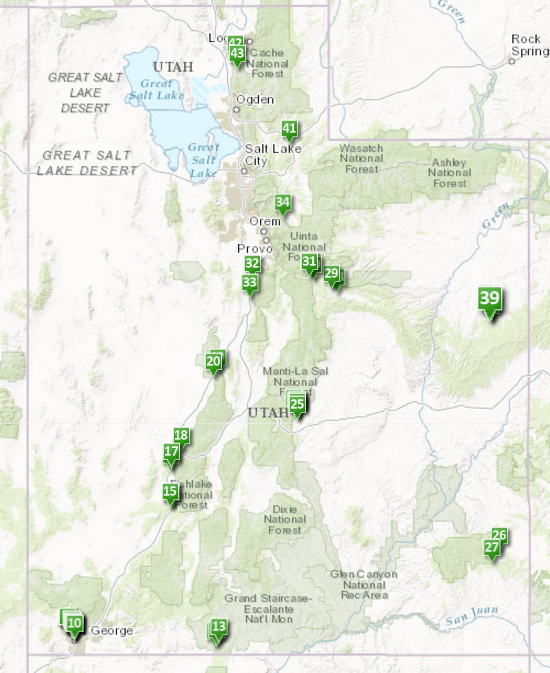 We put together an interactive web map that shows Utah’s wildlife crossing structures. UDOT and UDWR have had a lot of help from other partners in Utah’s wildlife crossings effort. Some of these partners include: sportsmen organizations like the Mule Deer Foundation, Sportsmen for Fish and Wildlife, the Rocky Mountain Elk Foundation, the Utah Foundation for North American Wild Sheep and Safari Club International; counties; the Bureau of Land Management; US Forest Service; US Fish and Wildlife Service; the Federal Highway Administration; and Utah State University. UDOT, UDWR and partners contributed funding to complete a six-year statewide research project (2007-2013) to determine how well wildlife crossing structures around the state are working. Dr. Patricia Cramer was the Principle Investigator on this project which resulted in millions of photographs being taken on dozens of structures over the study period. Dr. Cramer documented more than 43,000 successful mule deer passages through wildlife crossings over the six-year period. She also documented use of crossings by elk, moose and a variety of other Utah mammals. A report of this study as well as other wildlife related research can be found at UDOT’s website. The photos below are courtesy of Dr. Cramer. Wildlife crossings in UtahWe’ve worked closely with UDOT, Utah State University, counties and sportsmen groups to understand wildlife movements and install crossings, ramps and fencing to reduce wildlife-vehicle collisions. Here’s a look at some of Dr. Patricia Cramer’s photos, showing how wildlife are using these corridors in Utah. << (Previous) Pelicans at Strawberry Reservoir: what do they eat? Fantastic. Turtles and turkeys use also. As we travel the state we have assumed that these were game crossings but didn’t know how they worked. Thanks for the helpful information. Well done. This is a good article and I am glad these are being build. We need many more in Southern Utah and I’m sure throughout the state. Please keep us updated. Hi…. is it possible to redesign anything suitable for a deer corridor around the area of I80, 215E and Foothill Drive? There are always doe and fawn dead in the ovetpass and roads in the area, killed by cars. Presumably trying to get to water/food in the Tanner Park area. If this is not possible can some alterations be made to make this area (the eyesore, suicide rock, for example),more suitable and safe for wildlife? I live in this area and would appreciate a more wild life friendly area. Thank you for youe attention….